We are offering our clients with alluringly designed Stainless Steel Table Ware. Under this range, we offer Stainless Steel Thali Set to our valued clients. Designed using high-grade stainless steel and advanced machinery, these offered table wares are in compliance with the defined parameters of the industry. Furthermore, we precisely design these utensils while taking into consideration requirements of the clients and market demands. To meet divergent demands of the clients, we offer these products in different sizes and designs. 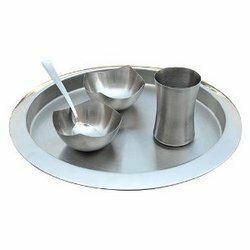 We are providing our clients with magnificently designed Stainless Steel Thali Set. These products are designed and developed using supreme quality stainless steel and advanced machines in line with the defined parameters of the industry and prevailing markets demands, to meet expectations of the clients. Furthermore, to cater to the divergent demands of clients we offer these products in different sizes and significant designs.